Suwon World Cup Stadium, often referred to as Big Bird Stadium, was built to serve as a playing venue for the 2002 World Cup. It opened on 13 May 2001. During the World Cup, the stadium hosted three group matches and the round of 16 match between Spain and Republic of Ireland (1-1). Suwon World Cup Stadium’s roof was inspired by the wings of a bird in flight, whereas the seats were modelled after the city’s Hwaseong Fortress. Suwon World Cup Stadium is located toward the east of the city of Suwon, almost next to the Ajou University campus. The stadium lies a few kilometres east of the Hwaseong Fortress, but further away from Suwon Station, the business districts, and most popular nightlife areas, which lie south or south-west of the stadium. Suwon is situated about 30 kilometres south from Seoul and can be reached from the capital by train or metro. Take metro line 1 in the centre of Seoul and get off at Hwaseo Station. The taxi ride from there takes 15 to 20 minutes. Alternatively, continue to Suwon Station and take a bus from there. Bus 86, 100, 720 (and 720-1 and 702-2) all run past the stadium, often via Ajou University. Buses that connect the stadium with other destinations include bus 2, 1007, 3001, 3007, and 7000. Tickets for Suwon Bluewings matches can be bought online, or by phone +82 1544 1555. Tickets can also be bought at the gates of the stadium from three hours before the start of the match. 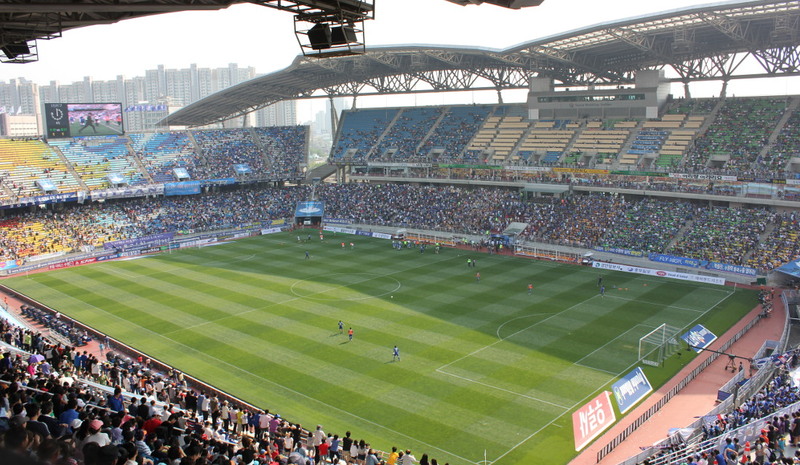 Suwon’s attendances are among the highest of the K-League and it sells out the occasional high-profile match. Tickets cost either KRW14,000 for a seat behind one of the goals or one of the sides, or KRW22,000 for a seat at the main stand. Suwon World Cup Stadium houses a museum on the history of Korean football that includes a 2002 World Cup memorial. The museum is opened daily from 10:00am to 5:00pm and entrance costs KRW1,000. Bluewings.kr – Official website of Suwon Samsung Bluewings. Suwonworldcup.or.kr – Official website of Suwon World Cup Stadium. Suwon.ne.kr – Suwon tourist information.